This writing launches from the stance of architectural enthusiasm. Curiosity propels it, refreshed continually by experience and perception. 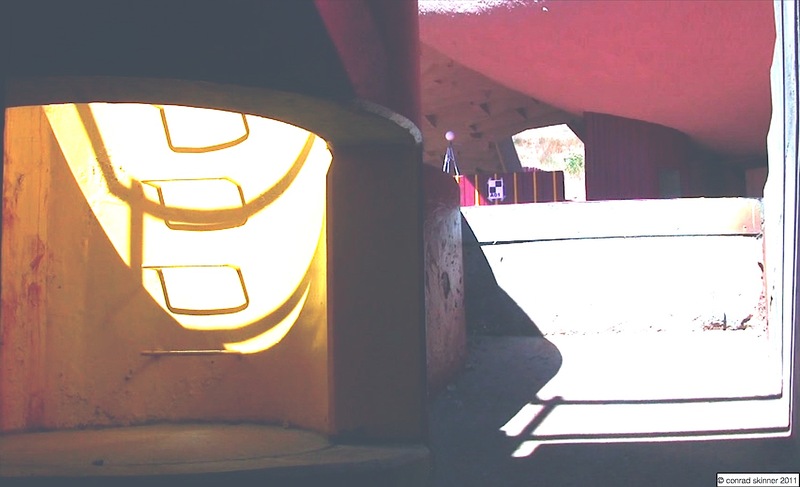 The Paolo Soleri Amphitheater at the Santa Fe Indian School stands among six commissions by the late Soleri, internationally recognized architect and theorist of cities. In 1965, by American Indian educator Lloyd Kiva New’s invitation, he designed the earth-formed concrete theater bowl for the Institute of American Indian Arts (IAIA) performing arts program. Established in 1962, the IAIA offered the first academic curriculum in multidisciplinary arts education to indigenous students from the Americas. Contemporary Native drama and its architecture were born cotemporaneously at the IAIA. New, IAIA arts director, asserted that earth-formed construction suited an Indian arts venue. From 1970 until its 2010 closing, the amphitheater sustained varied educational and entertainment events. Mimi Kessler, Swiss mime, opened the venue. The IAIA brought choreographer Juan Valenzuela to teach during the Indian Summer seminars of 1971. Students at the Indian School (K-12) have known it as the site of their scholastic promotion and graduation ceremonies. Northern New Mexicans also knew it as a favorite concert venue and site of fourteen Native Roots and Rhythms Festivals. A D. H. Lawrence Festival featuring N. Scott Momaday and Elizabeth Taylor filled the theater in 1980. Family, friends and admirers attended memorial services for theater supporters Stewart and Lee Udall. The Indian School closed the amphitheater for both public and intramural functions following Lyle Lovett’s final concert July 29, 2010. While attending the Stewart Udall memorial I looked carefully at the theater: The thrust stage with itʼs cavelike shell. The bridge and upper stage over the shell. Two vomitoria tunneling to the foot of the stage from under the audience seating. Paired hollow columns rising from lower stage the upper stage balcony. Stairways flanking the columns to penetrate the shell. The tower stage right and the canyon ramping down stage left from the background earthwork. The amalgamated elements evoked a fantastic landscape, not the blank stage of modern theaters. Never had I seen a stage so inviting of physical engagement by performers. Curiosity led me to Arcosanti, Soleri’s laboratory town an hour’s drive north of Phoenix, Arizona. There I was allowed an ‘audience’ with Paolo, aged 91 and invited to attend a ‘school of thought’ where he, his apprentices and guests discussed his philosophy and works. Visiting his archive, notebook sketches and architectural drawings opened my eyes to Indian inspiration for the amphitheater design. Readings in the IAIA’s Santa Fe archive confirmed that the school had written a program in Rolland Meinholtz’s Notes on Indian Theater and Practice for its new building. Conversations with surviving early IAIA staff and students deepened understanding of the theater’s design, construction and importance to the students. Speaking with Soleri and members of his construction crew provided details on building the theater. The archive of Pacheco and Graham, executive architects, illuminated the construction process through drawings, letters and contractors’ records. Archival photographs illustrate the phases of Soleri’s ‘silt pile’ earth formed concrete technique. Christy Stanlake, in her Native American Drama: A Critical Perspective, while acknowledging early twentieth century public Indian writer/performers such as Te Ata (Chickasaw), Lynn Riggs (Cherokee) and Will Rogers (Cherokee) cites the IAIA program as the first dedicated to training in Native drama. This history examines architecture’s role in establishing the drama project. The history emphasizes concept, design and construction and use, comparing IAIA theories with Soleri’s drawings and the theater as it exists. It sets the building in the evolution of post-World War II Indian arts and education. An architectural typology’s emergence signifies an energetic cultural moment. The Soleri did not evolve organically from previous forms. Lloyd New, Charles Loloma and Rolland Meinholtz researched ancient and existing dramatic forms and venues to consciously derive the Notes. Soleri, through months of iterative design interpreted the Institute’s program into the theater’s form. Interviews with Soleri, Meinholtz, Cosanti members, IAIA faculty and Native dramatists. Research in IAIA, Arcosanti and University of New Mexico archives and historical documents. To study Lloyd New’s and Meinholtz’s texts and Soleri’s annotated sketches opens understanding of the amphitheater’s form and purpose. Vertical passage: from beneath the audience…through the shell upper right. The picture emerges of a theater whose components synthesize abstractions of traditional tribal ceremonial spaces into an architecture for performance of secular Indigenous drama. Soleri abandoned the one-point perspective and proscenium-as-picture-plane of western theater in favor of creating a three-dimensional field of dramatic action. The amphitheater, in unique multi-dimensionality, becomes an armature for performance, inviting actors to physical engagement and dramatic projection from its specific forms. This entry was tagged amphitheater, architecture, institute of american indian arts, lloyd new, native american drama, paolo soleri, paolo soleri amphitheater, rolland meinholz, santa fe, santa fe architecture, santa fe history, santa fe indian school, santa fe theater, theater architecture, theater design. Bookmark the permalink. Thank You!, Conrad, for this great history lesson, and all of the architectural and cultural enthusiasm found in this site! When I was in Santa Se two weeks ago, I was told, that the theater now had beed torn down..As it was on Indian property it would be difficult to verify this. A week later I visited Arcosanti, and there they told me, that everything else around the theater had been demolished but not the theater itself. So what’s right? from what one sees from Cerrillos Road, looks like its still standing. originate within the period of the Amphitheter synthesis? don’t know. Ask Jeff Stein or Tomiaki – at arcosanti. The Soleri amphitheatre preceded publication of that book, Gary, by a few years, if that is what you are asking.